Marshall President Jerry Gilbert and SGA President Matt Jarvis lay a wreath onto Supreme Court Justice John Marshall’s grave in Richmond, VA.
Marshall University President Jerry Gilbert and other university members traveled to Richmond, Virginia last weekend to visit the gravesite of Chief Justice John Marshall, the influential Supreme Court justice whom Marshall is named after. Marshall is buried at the Shockoe Hill Cemetery alongside his wife and other family members. Gilbert and others were there to both pay their respects to Marshall as well as to clean and tidy up the area in the cemetery. Those in attendance cleaned up the surrounding area by raking leaves and picking up sticks that had collected in the area. They were also able to clean the gravestones of Marshall and his family. Gilbert said being in the cemetery where such an influential figure in our nation’s history is buried was moving and that he was pleased he and others were able to improve the surrounding site. Those in attendance also laid a wreath in front of the gravesite and placed patriotic bunting on the fence surrounding Marshall’s grave. “I think it was meaningful and appropriate and that it also tied us to that site where John Marshall is at rest with his family and it really made us feel connected,” Gilbert said. 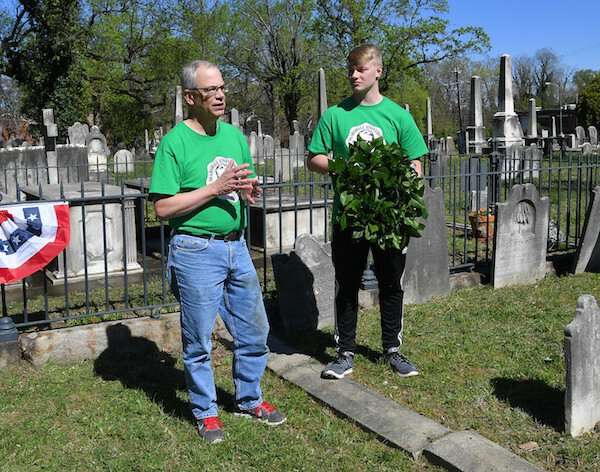 After the site and surrounding area was tidied up, there was a short ceremony honoring Marshall where the Marshall University fife and drum corps performed. Those in attendance also participated in a tour of the cemetery, where they learned more about Marshall as well as the related grave sites nearby. During the tour, they learned that after Marshall’s wife Polly died he would walk every day to visit her gravesite. “It did make us feel like we were there paying our respects to him and recognizing him as a person,” Gilbert said. Senior Vice President of Communications Ginny Painter said before they left the cemetery the drum corps had requested they sing the song “Sons of Marshall,” which had not been on the schedule. It’s wonderful to learn that the university is looking after the graves of my esteemed ancestor and his family. Please pass along my appreciation for their thoughts and efforts. As I now live in Australia, it is very difficult to visit and maintain the site.